My dad is at Sunrise of Wayne. Were happy with it, most of the people are caring and helpful, and they addressed some issues we had. When you walk in, the secretary was very nice, and everyone I met was extremely caring. Its a caring community, its a clean place, and the food is good. I would like to see more Parkinsons/veterans affairs there. Sunrise of Wayne, a Victorian style facility, is beautiful both inside and out. The plants, flowers and landscaping are meticulous. Inside is decorated in the same theme and is bright and cheerful. The wrap around porch outside has rocking chairs and flowers and is a beautiful space to sit, rock and relax. The dining room and seating areas are designed for comfort and conversation. The staff is friendly and helpful and always make you feel you are their first priority. The resident rooms are equipped with all the necessities and designed for comfort and convenience. The staff ensure the resident is on time for meals and activities and always encourages their participation. There are activities for everyone, no matter what their interests are. I know we picked the best facility and am grateful to have found it. Sunrise of Wayne is a nice place, and they're taking good care of my father. It's very friendly, clean, and has easy access. Sometimes the parking is a bit full, but usually it's not too much of a problem. The layout of the room is OK. It's not as big as a motel room, but it's adequate for my father and good. The staff is very nice, always very pleasant to deal with, and very helpful. People watch TV, play games, and sometimes eat together in the more common areas. The food is OK. My dad gets a choice of what he wants to eat and seems to like it. They bring the food to him three times a day, and he's happy with that. The reason we chose the place is it's nice enough and it was very close to where I live. My dad moved in March. What a blessing Sunrise of Wayne has been for our family. My uncle has been there one year today and just turned 100 years young. He still enjoys his own apartment but has the help of many to encourage and care for him daily. From the moment you enter Sunrise, you sense you are among "family" and with a smile and warm greeting, you are welcomed by name. I call Sunrise the "Cadillac" of Senior Living and am thankful that my uncle lives there! I give thanks we can give my uncle the very best for he has always given each of us his best! Stop in, I'm sure you will agree! Sunrise of Wayne seemed to be a very accommodating and clean place, and the person who conducted the tour was very helpful. The place looked like a happy and comfortable place to live in. The rooms looked comfortable and were an adequate size. My visit with Sunrise was very favorable. The staff was very good, and very helpful. The place was very bright. It had lots of natural light, and a lot of windows. They had activities. The dining room had a homey feel. I was very impressed with Sunrise of Wayne. It was very clean, very nicely designed, and recently renovated. The staff was very attentive. The entrance was beautiful. Sunrise of Wayne was very thorough in the information they provided, and they were very welcoming. The facility seemed well cared for, clean, and it looked like a decent place. It was a very pleasant visit. Sunrise of Wayne was very nice. The staff gave us a tour, introduced us to a lot of people, and showed us the activities. It was a lovely environment. I think it is very expensive for the size of the room that you get. My son will be moving on Monday to Sunrise. I chose it because there is a number of other men there of same age as my son, and they do have a lot of activities. He has a private room, and I think it is about the same as what he has right now. They say he will always have a plenty of food because where he is right now, he has been denied food. The staff seems to be fine. Another thing is that they take them out to church every Sunday if they like to go, and that is something that is very important to him. I chose Sunrise of Wayne for my mom because it was close to me, the people were very nice, and the facility was very nice. My mother is always nicely dressed and clean, her apartment is always neat and clean, and she seems happy. Whenever I visit, she is almost never in her apartment. She is always doing things with other people. They call me if I need to know of any medical issue; they keep me informed, so I am very happy with it. It has a very homelike feeling, and I feel very comfortable with her being there. I feel like she is very well taken care of. I also liked Sunrise of Wayne very much. They separate the people who were not necessarily Alzheimer's but sort of have certain needs, and they try to protect the more normal people in different sections. I think you didn't have to go to the dining room and see people who really were slobbering all over the place. That was the most expensive of the three facilities I've visited. It was a place where people in rather good shape could retire. You can get one-bedroom, two-bedroom, or a suite, but you don't have to buy the unit. You will just be dealing with a monthly fee. Sunrise of Wayne was cheery and open. There were a lot of skylights. I didn't really like the room, but I liked the place. It was very clean. I didn’t meet any of the staff. I just met a lady, and I don't know what her title was, but she's fine. Sunrise of Wayne was clean, immaculate, and very stunning. The people were extremely friendly and informative. We asked a lot of questions, and they answered. I was interested in the studio apartment, and we got the pricing to see if I could afford it. I went inside one of the studios, and it was furnished. It was like a room and a half with a bed on one side. There were chairs, television, computer, refrigerator. I thought it was previously owned by a lady. They had a list of activities all day, happy hour on some days. They served three meals a day, and they were not so strict with the time. Even if breakfast was served at 8 a.m and the residents came down later than that, they still served them. They seemed cooperative, and I understand that once you signed up, they have a team assigned to your area. The team made the bed every morning for you, took the trash out, etc. They catered to the people, depending on your personality and not how they wanted things done. I would probably go there if I'm ready to. The staff was wonderful at Sunrise of Wayne. The parking lot and the sidewalk were not cleaned up at all. I had a hard time getting in the building because of the snow and the ice. When I went inside, there seemed to be a major leak. There were big buckets everywhere in the area. It seemed to be not the right day for the visit, but everybody seemed to be very nice. The place was great and beautiful inside. Their rooms seemed nice. I was not able to eat there, but their dining area seemed very nice and clean. They had a nice variety of things to do. A lot of them had to do with cooking, as far as I can remember. I didn’t like Sunrise at Wayne as much as the other place I visited. I just didn't like the rooms; they were not handicapped-accessible rooms. But the staff was really friendly, and everything else was good. I didn’t see as many residents. I saw some in a room in a class or something. They have a library, a recreation room, and a common center. Sunrise is like a Victorian home mansion with a lot of apartments inside and it's only got two floors. My grandma has a beautiful apartment. It's cool, it's a nice place. They have all kinds of good services for them. They take the garbage out and they clean. When they eat, it's like a restaurant style. I know she plays bingo. She gets her hair done at the beauty salon like once or twice a week. She plays keno and they take them places like Christmas tree shops, to shopping centers in Wayne. I know she gets her medicines and everything taken there. I really think they do such a good job. They even have a family fun day once or twice a month and I went to the one for Halloween. We got dressed up when we went there and then they had something else for New Year's and they had belly dancers. That was super cool. I didn't think I was going to like it but it was different. I knew of Sunrise Assisted Living because a client of mine has his mom at their other site. This one's in Wayne, NJ. It's a lovely facility, brand new and I was looking for the least expensive room. The staff are really, really nice and they still call me from time to time to let me know when they have an inexpensive room available. The place is absolutely beautiful; they have activities like arts and crafts. They set it up the place it's like a hotel. It's really, really nice. My wife, an Alzheimer"s patient, received the most tender, loving care that I have ever seen. 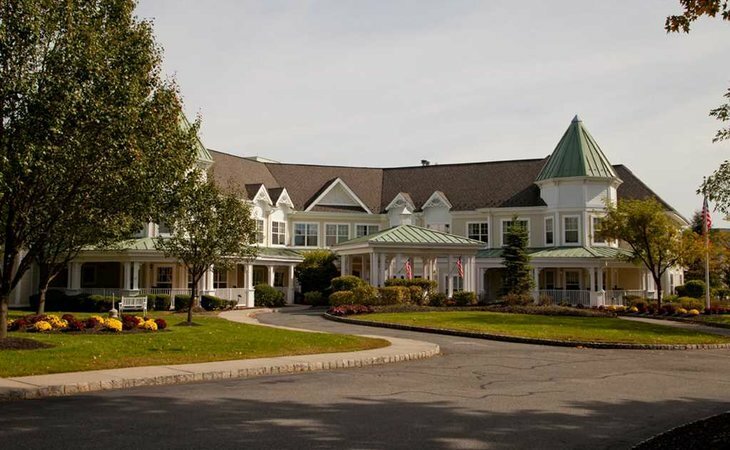 Located just minutes from Route 80, Route 287 and Route 23, Sunrise of Wayne is nestled in Passaic County, conveniently situated between Morris County and Bergen County. Our community is in a beautiful, scenic setting with lush grounds overflowing with gardens and pathways. We also offer a variety of activities within our community, including socials, games and a monthly Family Night, which is anxiously anticipated each month! More importantly, we pride ourselves in our professional, caring team members who provide unparalleled service to our residents and their families. What should caregivers and potential residents know about Sunrise of Wayne?